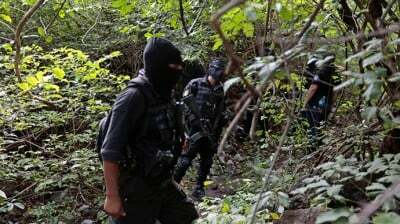 Mexican federal forces have disarmed the entire police department in the southern city of Iguala after its officers were accused of collaborating with a gang behind the recent disappearance of 43 students. On Monday, the government’s new federal police unit took over security in Iguala, located some 200 kilometers (125 miles) south of the capital, Mexico City. The federal unit was tasked with holding order in the city and helping search for the students who went missing last month after a deadly police shooting. The deployment in the southern violence-stricken state of Guerrero came after President Enrique Pena Nieto vowed to establish justice and bring an end to corruption in the country. Pena Nieto said he had dispatched the federal forces to Iguala to “find out what happened and apply the full extent of the law to those responsible.”The decision to disarm Iguala’s police corps came just days after 28 charred bodies were found in a mass grave on the outskirts of the city. State prosecutor Inaky Blanco has said the recovered bodies probably belonged to the missing students. State officials also say it will take up to two weeks to receive the results of DNA tests to identify the corpses. The students, all trainee teachers, went missing following a police attack on September 26 against a protest over teachers’ rights. According to Blanco, state investigators have obtained video footage showing local police arresting a number of students during the clashes and taking them away. Prosecutors said the Guerreros Unidos drug gang also participated in the police shooting that left six people dead and 25 others wounded. Mexican authorities have already arrested 22 officers and issued arrest warrants for Iguala mayor Jose Luis Albarca and his security chief over the deadly incident.